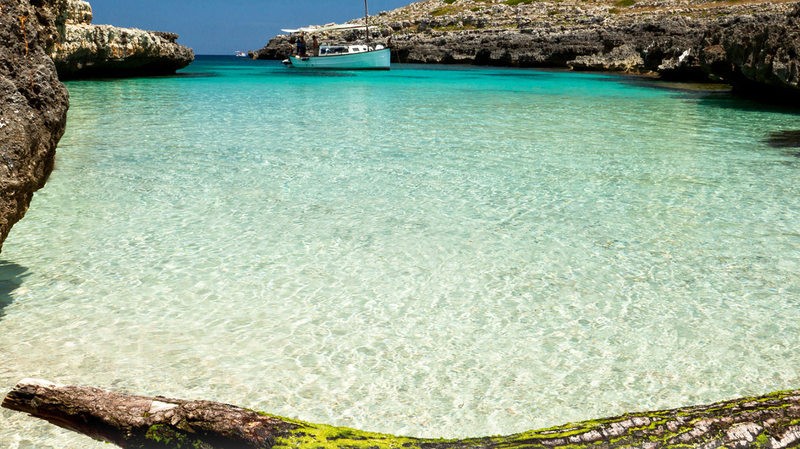 Search for the best flight prices from Manchester to Mahon, Menorca. Compare prices, book today and save money with Manchester Airport. As befits the capital city of the Island of Menorca, Mahon (or Mao, as it’s also known) has a seafaring tradition (and a militarily important one) at heart, with one of the deepest natural ports in the world, not to mention fabulous colonial architecture. Fly in and you’ll see a different side to the island – beaches, views and a laid-back vibe. Thanks to Franco, Menorca, or Minorca as it’s also known, remains relatively undeveloped outside the main cities of Mahon and Ciutadella. Most of the big resorts are along the south and east coasts, although the rugged north offers plenty of scope for those after peace. One property that offers the best of both worlds is Hotel Rural Sant Ignasi (Ronda Norte), a fantastically pretty country pile just outside Ciutadella. Head to the Sol Gavilanes (Urbanización Santa Galdana) for a beach break. Cheaper but just as convenient for sea and sand is the Prinsotel La Caleta (Signe Lleó) in Cala Santandria. Most of the retail action happens in the capital Mahon and the former capital Ciutadella. Along with branches of the ubiquitous Zara, Mahon is home to some seriously upscale boutiques as well as numerous souvenir and craft shops selling pottery and other handmade goods. Shoes were once big business and it’s still possible to buy a pair of locally made leather avarques (flat, unisex, slingback shoes) in most towns on the island. Also worth a try is the local moonshine – a spirit made from grape juice and juniper berries called Gin Xoriguer. Menorca is a fabulous place to eat and there’s no shortage of restaurants in which to try local favourites such as caldereta de llagosta (fragrant lobster stew) and mayonnaise, which was invented in the capital. In Mahon, head to Restaurant S'espigó (267 Moll de Llevant), which offers a huge array of seafood in chic surroundings, or Marivent (314 Moll de Llevant). Elsewhere, Ciutadella’s cosy La Guitarra (1 Carrer Dolors) is the place to go for hearty meat dishes and lashings of cheese and wine. For cheap and cheerful tapas, try Aurora (3 Plaça Ses Palmeres). A particularly entertaining way of shaking off the post-Christmas blues, San Antoni celebrations see locals dust off their glad rags for two days of bonfires, street parties and fireworks. A six-week celebration of all things jazz and blues, Menorca’s headline musical event sees concerts staged in venues across the island, although the biggest gigs happen in Mahon and Ciutadella. It’s not quite as spectacular as Pamplona but Valldemossa’s annual festivities do include a convoy of snorting bulls – some angrier than others. After you’ve enjoyed the bovine parade, head to one of the many street parties for a slab of excellent local steak. Binissalem is the scene of Bacchanalian festivities celebrating the local wine industry and not surprisingly, there are plenty of opportunities to try a glass or two. Celebrating all things gastronomic, the traditional festival of Dilous Bo is a feast for the senses in more ways than one. The little town of Inca is the hub for celebrations and you’ll have plenty of opportunities to taste local favourites such as ensaimada pastries and fennel-fragranced cuixot sausages.